At Moss Fabrication Ltd., our success is attributed to over 30 years of unwavering commitment to quality and delivering on our promises to clients. Every day, this is demonstrated through our rigid quality control process, safety procedures, and all the way through our shop and field operations. We look forward to the next 30 years of service to North America’s gas and oilfield operations! In ensuring the quality of each design we fabricate, we strictly adhere to the regulatory codes of the Canadian Standards Association (CSA), American Petroleum Institute (API®), and American Society of Mechanical Engineers (ASME). We also fabricate piping to ASME B31.3 & B31.1. We are also authorized to use the “U” stamp, indicating compliance with Section VIII, Division I of the ASME code, as pertaining to Pressure Vessels. In addition, we are also audited by the ISN Network; this makes it possible for our clients to call and confirm our company’s safety compliance and much more. Moss Fabrication offers in-house design and drafting, drawing on our vast experience and knowledge. Moss Fabrication Ltd. does not directly offer or supply engineering services. All engineering services are provided through qualified and legally authorized third party companies and individuals. Although we take pride in maintaining a rapid rate of production, safety is always our top priority. Safety isn’t something to be simply observed, but practiced every day throughout the production process. Moss Fabrication Ltd. conforms to all legislated requirements and codes, as well as our own internal safety program. Within Calgary’s Foothills Industrial Park, Moss Fabrication Ltd. is home to 19,000 square feet of production space, situated on 8 acres of secured property. In this facility, we have a staff of over 50 dedicated personnel who carry out fabrication, sheet metal work, sandblasting, and painting requirements. Our facility houses four 5-ton cranes with 17 feet under hooks, as well as many state-of-the-art pieces of equipment. We have fabricated skid packages to 24 feet wide, 58 feet long, and 180,000 lbs. Give us a call today at 403-279-4950 to speak to a service representative or to place an order! We are proud to continually support important charities: Between Friends, Breast Cancer Supportive Care, and AARC – Adolescent Addiction Recovery Centre. For additional information about our company, simply give us a call today. 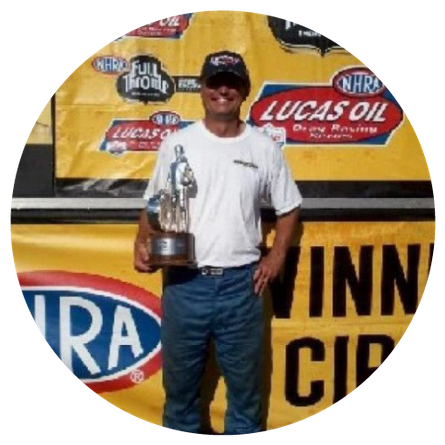 Owner Ken Mostowich’s main hobby is racing and he’s been doing it for over 25 years – check out the Moss Racing schedule!